Wouldn’t it be cool if there was a brand of candy that was actually good for you and did more than just cause your teeth to fall out? Unfortunately, no such candy exists, but the folks at Hillside Candy have come awfully close with their “healthier-for-you” Go Naturally hard candies. These organic bad boys are free of gluten, free of preservatives, and made without high fructose corn syrup. 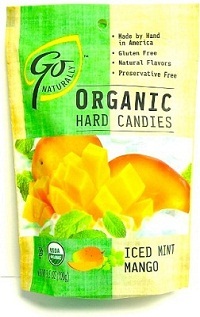 Recently, two new flavors, Blood Orange and Ice Mint Mango, have been added to the Go Naturally line-up, but without all theÂ unhealthy-but-delicious parts, do theseÂ candiesÂ taste any good? They do! 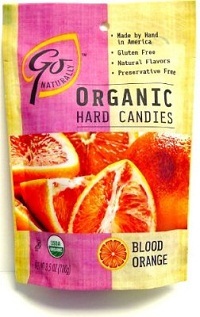 The Blood Orange flavor tastes like… well… oranges. Iâ€™ll admit, Iâ€™m not quite sure how blood oranges differ from regular oranges in terms of flavor, but if this candy is to be trusted, blood oranges are sweeter and less tart. Both flavorsÂ last for a very long time,Â but if you’re impatient like me, you can chew into them after a little while forÂ that extra burst of fruity or minty goodness. So if youâ€™re looking for someÂ ”healthier-for-you” organic candy, Iâ€™d highly recommend giving these two flavors of Go Naturally a try. Actually, it doesnâ€™t matter if youâ€™re lookingÂ out for your health or not! Try some anyway! They taste great.